We analyze consumer reviews to find the best products on the web. We buy products with our own money and test them in our lab. We also interview experts and conduct independent research to pick the winners. We have affiliate partnerships so we may get a share of revenue from purchases. It’s how we fund our Research Lab and bring you better reviews and comparisons. Read more. This is Amazon’s top choice for a U-shaped, full body pillow and the best body pillow on the market. We love that the premium down is hypoallergenic and odorless. This pillow is also incredibly easy to clean—it never clumps, even after repeated washings. The covering may be a little rough and the pillow may slightly lose its shape over time. 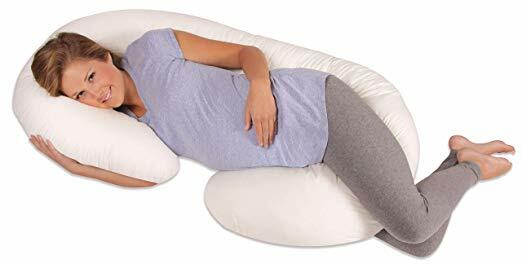 Perfect for pregnancy and maternity (the patented design was developed by a registered nurse and mom), this pillow supports the hips, back, neck, and stomach. 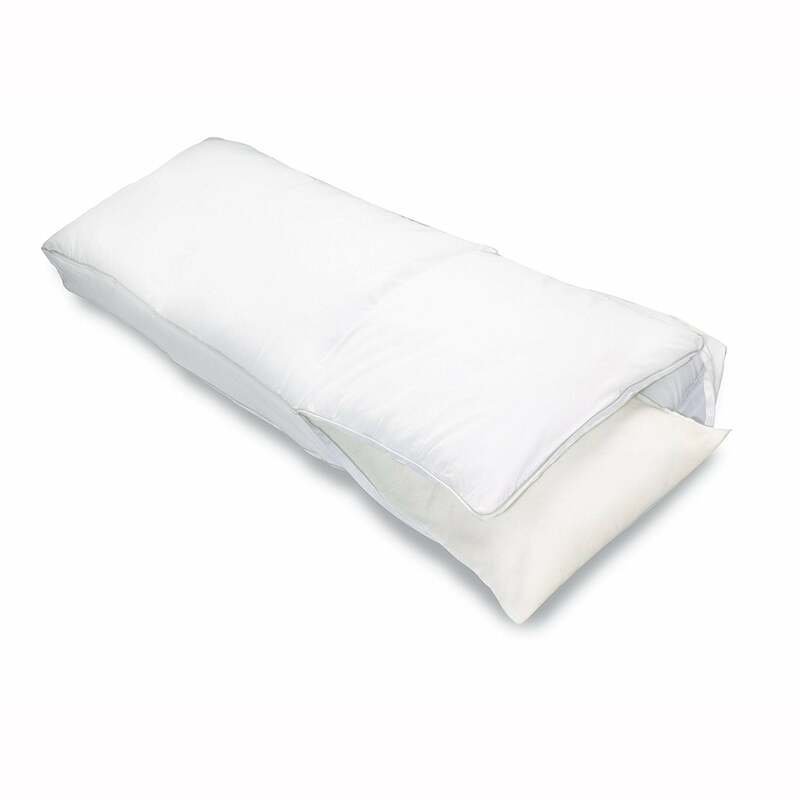 This large body pillow can be used during sleep or when sitting up in bed. The Snoogle also has a sham-style removable cover that’s machine-washable. The cover can be difficult to put back on after washing. The surface material is also a little scratchy. This is a great choice for expectant mothers or those who are looking for a smaller body pillow. It’s thick and fluffy but it compresses well under moderate pressure. It’s also one of the lighter body pillows we reviewed. A body pillow cover is not included. Some users have said that the pillow is a little too squishy for their preference. Thanks to its innovative pollen and pet dander barrier, this one is perfect for all allergy sufferers. Great for side sleepers, this is an affordable alternative to some of the more expensive body pillows on the market. Some customers wish it had more stuffing. This memory foam body pillow is designed for anyone who needs improved rest, relief, and relaxation. It has a wonderfully soft microfiber cover that can be easily washed. It sleeps hot and is heavier than the other body pillows. The filling may bunch up in some sections. The House Method team is passionate about getting a good night’s sleep (when we say we love sleep, we mean it). That’s why we took the time to review and test the best body pillows on the market to determine which ones offer the best sleep experience possible. We consulted thousands of body pillow reviews, tested pillows in our Research Lab, and spent hours researching the most important factors to consider when buying a body pillow. We did the work for you so you can rest assured that you’re getting the best of the best. A body pillow is an oversized pillow that can provide an extra level of comfort and support while sleeping, improve spinal alignment, and lessen tossing and turning throughout the night. These pillows are nearly the size of a full-grown person and mold themselves to your body to eliminate pain at pressure points and offer better support. They’re ideal for pregnant women, those who suffer from arthritis or painful joint conditions, or anyone who needs a little extra comfort in bed. With so many body pillows on the market, it can be confusing to know which one is right for you and your sleep needs. That’s where our House Method Reviews team comes in. Because we believe that everybody deserves a good night’s sleep, we’ve taken it upon ourselves to learn what makes a pillow great and what people look for when buying a body pillow. Our goal is to provide you with the most honest and accurate information so you can find the best body pillow for a better night’s sleep. Who needs a body pillow? Those who suffer from back pain or hip pain—By propping a pillow between your legs, you can relieve pressure around the hips and knees and get up out of bed with less pain. Pregnant women—If you’re pregnant, a full body pillow can help align your spine and give you a more comfortable sleep by reducing strain on the back and abdomen. Those who need cushion in vulnerable areas—If you need more support around your neck and shoulders, a body pillow may provide some relief. People who experience severe pain—If you have an autoimmune disorder, arthritis, the flu, or restless leg syndrome, a body pillow can help you adjust your limbs for a more comfortable sleep. They can also help reduce gastric reflux, nasal congestion, and headaches. Side sleepers—Body pillows have a contoured support system that aligns the spine and lowers back strain while sleeping. Rectangle—Rectangular body pillows look like normal pillows but are slightly longer (they usually range between four and six feet long). They’re great for all types of sleepers and commonly used between the knees to help relieve hip, lower back, and knee pain. 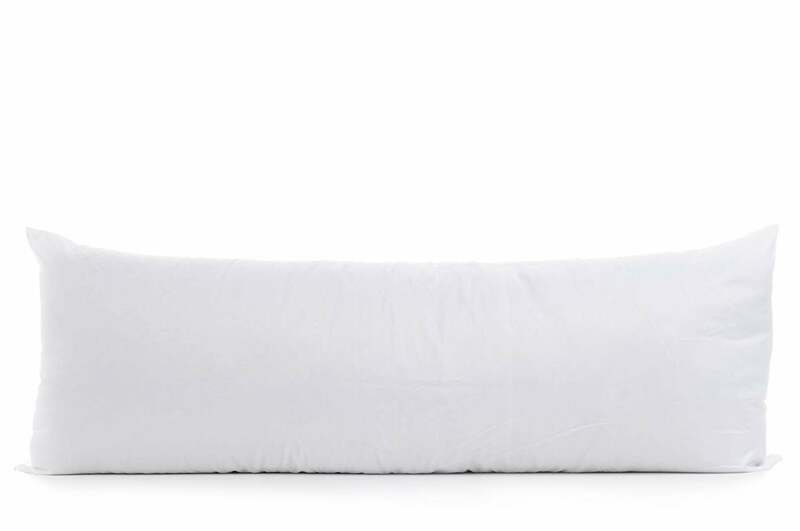 U-shaped—These extra large pillows will support your spine, neck, and hips. Not only are they great for pregnant women, but they also help anyone with painful joints and muscles. C-shaped—Similar to U-shaped pillows, C-shaped body pillows are a top pick amongst pregnant women. We recommend the Leachco Snoogle Total Body Pillow—it supports the hips, neck, back, and stomach, all while providing a relaxing, comfortable cushion for expecting moms. Look for maternity pillows that have a bit of extra contouring along the inner edge, which helps the pillow conform to the shape of your body. J-shaped—J-shaped pillows are curved at the top and bottom, but the curves are slightly less pronounced than those on a C-shaped pillow. 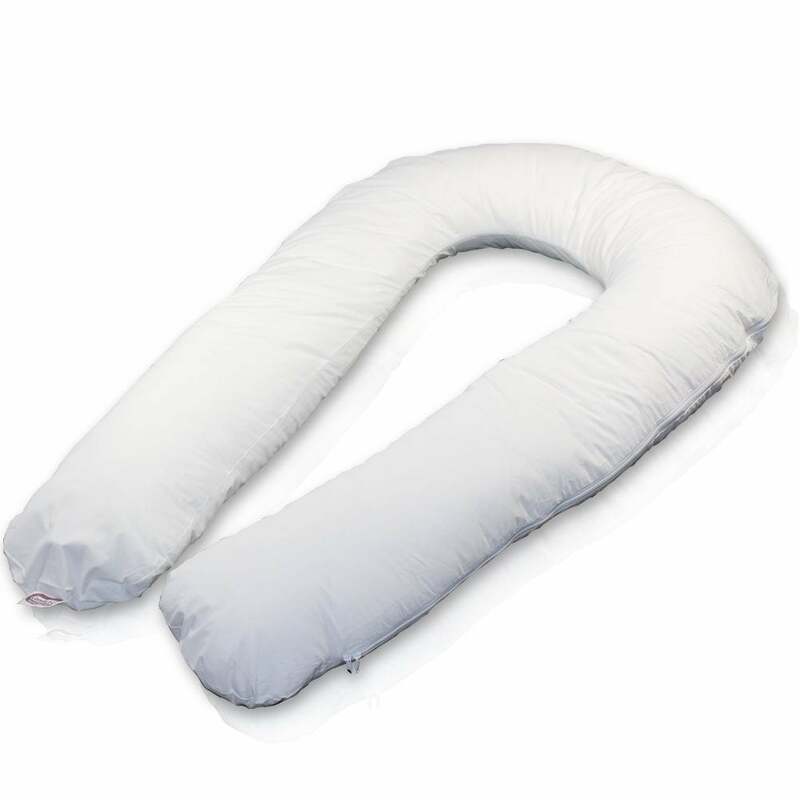 These pillows help raise the upper body slightly to relieve nasal congestion, headaches, and gastric reflux. Pillow filling makes a difference in how your pillow holds up over time, how it supports your head and neck, and the amount of comfort it brings. Just like regular sleep pillows, you can choose from a variety of fills. Polyester—Synthetic polyester fills are the most common and inexpensive type of fill. Polyester pillows are inexpensive and can hold their shape longer than cotton pillows, but they may become lumpy and less supportive over time. Synthetic fills are hypoallergenic, so if you suffer from allergies, this may be a great option. Memory foam—This material provides excellent cushioning by contouring to your body and relieving pressure points. Side sleepers benefit the most from memory foam pillows since the material easily adapts to their bodies to provide the right level of support. Note: memory foam tends to sleep hot. Shredded memory foam—Similar to memory foam, shredded memory foam is made up of the same material but torn into smaller pieces that make it soft, light, and cool. Microbeads—Microbeads are light and can mold into a variety of configurations. Microbead pillows won’t give you as much support as polyester or memory foam. Down—Plush and luxurious, a down-filled body pillow is made from soft, down feathers. These pillows are moldable and allow your head and neck to sink right into the pillow. A down-filled pillow may be soft, but similar to a microbead body pillow, it won’t give you much support. If you’re allergic to down, opt for a down alternative fill. Cover material is a matter of preference, but we’ve found that polyester and bamboo seem to offer the most comfort to buyers. Other popular body pillow cover materials include cotton or a poly-cotton blend. Note: it may be tougher to find pillowcases for body pillows than it is for standard pillows. Most body pillows are large, but some (like the U-shaped pillows) are so big that they take up your entire bed. If you sleep with a partner, look for a rectangular body pillow that takes up only half the bed space. Memory-foam pillows are especially heavy, making it harder to transport. If you plan on moving your body pillow back and forth from your bedroom to the living room, go for a lighter option like polyester or down. If you want basic support when sitting up in bed or pain relief, go for a rectangular pillow. If you’re pregnant and have difficulty falling asleep, you may find a U- or C-shaped pillow to be a better option. Expect to spend between $40 and $75 on a high-quality pillow that offers comfortable support and relieves pain. Note: some maternity pillows may cost a little more depending on their size and fill. Do body pillows help relieve back pain? Yes, body pillows can help align your spine and alleviate muscle and joint pressure. 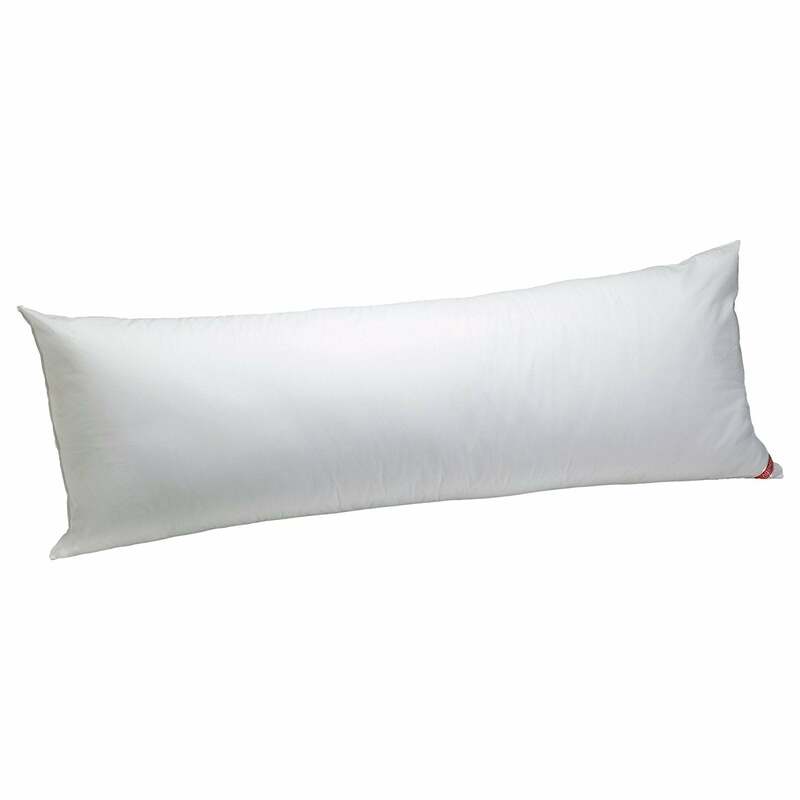 The Pegasus Home Fashions Body Pillow is thick and fluffy but compresses well under moderate pressure. We recommend this pillow for expecting mothers or those who experience pain in their back, hips, or legs. What is the best body pillow to buy? There are plenty of great body pillows on the market, but there are a few that we strongly recommend. The Moonlight Slumber Comfort U Total Body is filled with premium down that’s hypoallergenic and odorless and never clumps over time. It provides pain relief by targeting tight joints and conforming to the sleeper’s body. The Aller-Ease Cotton Hypoallergenic Body Pillow is great for allergy sufferers and is a more affordable alternative to other body pillows on the market. How do you use a body pillow? First, you’ll want to lay the body pillow along the length of your body. If you’re a side sleeper, place the full body pillow between your legs and cradle the pillow. You can also use a body pillow to prop yourself up in bed and support your back. Whether you’re moving into a new home, hosting overnight guests, or traveling, you’ll eventually need temporary sleeping accommodations. Buying an air mattress shouldn’t be complicated, but if getting a good night's sleep is important to you—or your guests—you might find yourself weighing your options. We compared the best air mattresses and compiled our research into a buying guide to make your decision easier. Whether you’re looking for a quality set of bed sheets for your guest room or just want to swap out your old, tired sheets in your bedroom, you’ve come to the right place. Stay in touch: Get the very best of House Method in your inbox each week. Site By New Media Campaigns. ONLY DAYS LEFT TO LOCK IN 2018 PRICING! Choice Home Warranty provides House Method readers with EXCLUSIVE DISCOUNTS. This Affiliate Compensation Disclosure is provided by House Method, together with its affiliates, including, without limitation, both mobile and online versions of our websites (collectively, referred to herein as the “Site”), and is provided for the purpose of disclosing House Method’s financial relationship with affiliates, advertisers, sponsors and other third parties that appear on the Site (collectively, referred to herein as “Affiliates”), pursuant to the Federal Trade Commission’s Guides Concerning the Use of Endorsement and Testimonials in Advertising, 16 C.F.R. Part 255. This Affiliate Compensation Disclosure has been posted on the Site or has otherwise been linked to in a post or article since House Method sells and thus receives monetary and other forms compensation from Affiliates for various advertising, sponsorships, insertion orders and promotional campaigns that we feature on the Site. Thus, there is paid connection between some of the products or services mentioned, reviewed or recommended on this Site and the Affiliate (i.e., the owner of that third party product or service). If you ultimately decide to purchase such a product or service mentioned on the Site, House Method may receive additional compensation from that purchase from the Affiliate. Further, the Site posts or otherwise promotes content, including editorial content, which may feature third party products and services (the “Affiliate Products”) and which may link to third party owned and operated web sites where you can purchase Affiliate Products. If you click on a link to an Affiliate’s Product on the Site and then follow the link to purchase an Affiliate Product on the Affiliate’s web site, House Method may receive compensation from the Affiliate offering the Affiliate Product. The content featuring Affiliate Product(s) may not always be identified on the Site as paid or sponsored content and the compensation that we receive from Affiliates may influence what content, topics or posts we make on the Site and where they are posted. Also, you may see third party ads posted on the Site. Each time you click on such an ad, we will receive compensation from the third party advertiser, even if you do not purchase something from the third party. Even though we may receive compensation in connection with your purchase of Affiliate Products as outlined above, we still seek to provide our honest opinions, findings, beliefs, and experiences as they relate to the products and services that are featured on the Site. Every effort has been made by House Method to provide true and accurate statements in regards to any and all products or services mentioned, reviewed or recommended by House Method on this Site. Should you have any questions, comments or concerns and would like to receive an answer or ask a question prior to purchasing any product or service mentioned on this Site, you can contact us at legal@housemethod.com.